Deutsch: Die Radkarte, eine mittelalterliche Form der Darstellung der damals bekannten Erde. Orbis a rotunditate circuli dictus, quia sicut rota est [...] Undique enim Oceanus circumfluens eius in circulo ambit fines. Divisus est autem trifarie: e quibus una pars Asia, altera Europa, tertia Africa nuncupatur. "The [inhabitated] mass of solid land is called 'round' after the roundness of a circle, because it is like a wheel [...] Because of this, the Ocean flowing around it is contained in a circular limit, and it is divided in three parts, one part being called Asia, the second Europe, and the third Africa." Isidore does not assume a flat earth, shaped "like a wheel", he assumes a round earth in correspondence to the theory of the spherical earth that had been the mainstream assumption at least since Aristotle. 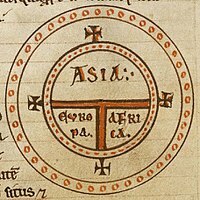 The T and O map represents the top-half of the globe, it was thought that no one had ever been to the ‚other‘ half, the antipodes, where some thought people known as antipodeans lived. The T consists of the Mediterranean, the Russian Don River and the Nile, dividing the three continents, Asia, Europe and Africa, and the O is the encircling Ocean. Jerusalem was generally assumed to lie at the center of the circle. Asia was typically the size of the other two continents combined. Because the sun rose in the east, Paradise (the Garden of Eden) was generally depicted as being in the outmost of Asia, situated at the top portion of the map. Español: Mapa de T en O, o mapa Orbis Terrarum, es un tipo de mapamundi elaborado en la Edad Media y caracterizado por su alta carga teológica. El primero en realizar estos mapamundis fue Isidoro de Sevilla. Diese Seite wurde zuletzt am 4. Februar 2019 um 14:44 Uhr bearbeitet.